8. Michigan State, March 18, 11:30 a.m.
Who to watch: Cornerback Justin Layne is an interesting prospect because of his length (6-2, 192) and the production he had as a Spartan. Layne ranked in the top 10 in college football last season with 15 pass breakups. He ran the 40 in 4.5 seconds at the Combine and had an impressive 37.5-inch vertical. Can he get into the 4.4-range in the 40 at his pro day? Also keep an eye on: Wide receiver Davis Felton, running back LJ Scott and safety Khari Willis. 7. Penn State, March 19, 10 a.m.
Who to watch: Trace McSorley turned down a request at the Combine to work out with the defensive backs. He intends to make an NFL future at quarterback. McSorley threw for 2,530 yards and 18 touchdowns. He also rushed for 798 yards and 12 more scores last season for the Nittany Lions. The knock on McSorley is that he only completed 53 percent of his passes last season. It will be important to show off his accuracy at this pro day. Also keep an eye on: Running back Miles Sanders, cornerback Amani Oruwariye, offensive lineman Ryan Bates, defensive lineman Kevin Givens, offensive lineman Connor McGovern and edge rusher Shareef Miller. View photos of the quarterbacks working out at the 2019 NFL Scouting Combine in Indianapolis. 6. Notre Dame, March 20, 10 a.m.
Who to watch: Alabama’s Josh Jacobs is widely considered the best running back available in this draft, but after him opinions vary on who could come off the board next. The Irish’s Dexter Williams is trying to put himself into that conversation. Williams averaged 6.3 yards per carry this past season in his first year as the full-time starter as a senior. The interviews might be the most important part of Williams’ pro day, however, as he missed the first four games of the season due to a suspension for undisclosed reasons. Are there character issues teams should be worried about? Also keep an eye on: Offensive lineman Alex Bars, wide receiver Miles Boykin, linebacker Te’Von Coney, cornerback Julian Love, tight end Alize Mack, defensive lineman Jerry Tillery and linebacker Drue Tranquill. 5. Kentucky, March 22, 9:15 a.m.
Who to watch: All eyes will be on top edge rusher Josh Allen, who continues to try and prove he’s the best pass rusher available in this draft. Allen had a good Combine with 28 reps on the bench and a 4.63-second 40-yard dash at 6-foot-5 and 262 pounds. He ranked sixth nationally last season with 21.5 tackles for loss and also had 17.0 sacks. Teams will put him in space and take him out of his comfort zone a bit to see what he can do. A good pro day could cement his status as top five pick. Also keep an eye on: Running back Benny Snell, cornerback Derrick Baity, tight end C.J. Conrad, safety Mike Edwards, cornerback Lonnie Johnson, linebacker Jordan Jones and safety Darius West. 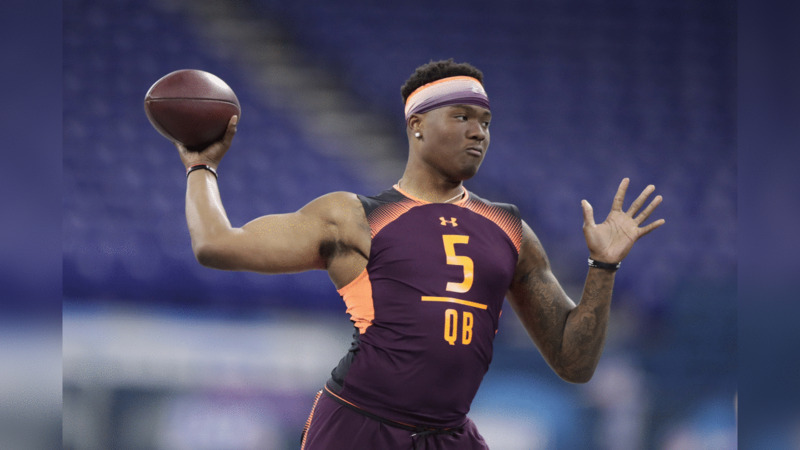 Who to watch: There’s a lot of top talent in Columbus to keep an eye on, but one of the interesting storylines as we inch closer to draft night will be how teams rank the top two quarterbacks in this class – Ohio State’s Dwayne Haskins and Oklahoma’s Kyler Murray. Haskins is a pocket passer with a big, accurate arm. Can a really good throwing session at his pro day convince a team he’s the best quarterback in this draft? Also keep an eye on: Defensive end Nick Bosa, wide receiver Parris Campbell, wide receiver Johnnie Dixon, defensive lineman Dre’Mont Jones, tackle Michael Jordan, wide receiver Terry McLaurin, cornerback Kendall Sheffield and running back Mike Weber. 3. LSU, March 22, 9 a.m.
Who to watch: Greedy Williams’ Combine workouts were cut short due to cramps, but not until after running a blazing 4.37-second 40-yard dash. That’s moving for a 6-foot-2 cornerback with sticky cover skills on film. Williams will have to complete some other testing at his pro day (bench press, vertical, etc), and the on-field drills will also be important for him. Also keep an eye on: Linebacker Devin White, safety John Battle, running back Nick Brossette, tight end Foster Moreau and kicker Cole Tracy. 2. Georgia, March 20, 9 a.m.
Who to watch: Some draft analysts think Georgia’s Deandre Baker might be the best cornerback in this draft. He ran the 40 in 4.52 seconds at the Combine. If he can lower that into the 4.4-range, teams will probably feel much better about potentially making him the first cornerback off the board in the draft, because the tape on him is really good. Also keep an eye on: Wide receiver Riley Ridley, wide receiver Mecole Hardman, running back Elijah Holyfield, offensive lineman Lamont Gaillard, defensive lineman Jonathan Ledbetter, tight end Isaac Nauta and edge rusher D’Andre Walker. Who to watch: Quinnen Williams should be the first defensive tackle off the board. Jacobs should be the first running back. Tight end Irv Smith Jr. isn’t expected to be the first tight end off the board – that’s probably going to one of the Iowa tight ends – but Smith will try and cement his status as a first-round pick with a good pro day. He averaged 16.1 yards per reception for the Crimson Tide last season with seven touchdowns. Teams will want to see how well he can block after he measured in at 6-foot-2 and 242 pounds at the Combine. If they feel comfortable with that portion of his game, he should hear his name come off the board Day 1 of the draft. Also keep an eye on: Defensive tackle Quinnen Williams, running back Josh Jacobs, running back Damien Harris, safety Deionte Thompson, tackle Jonah Williams, defensive lineman Isaiah Buggs, edge rusher Christian Miller, tackle Ross Pierschbacher, cornerback Saivion Smith and linebacker Mack Wilson. 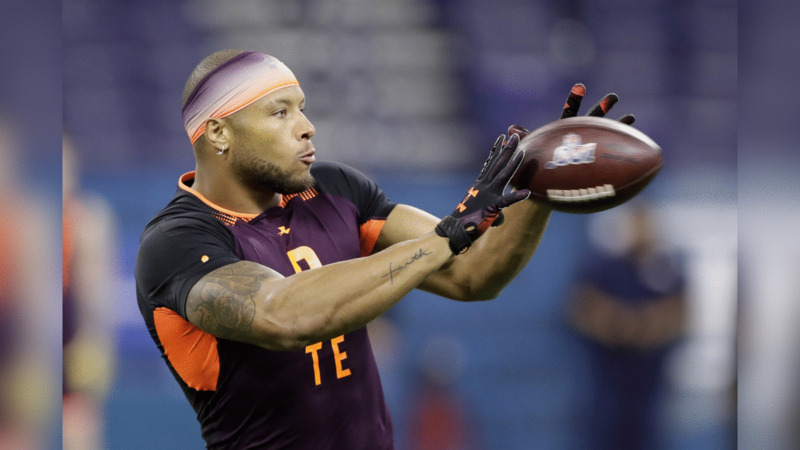 View photos of the tight ends working out at the 2019 NFL Scouting Combine in Indianapolis.